Figure 6-1 shows the structure and the parts of which the vocabulary exists. First you need a message (the section called The message model) containing the actual civil engineering information you want to communicate. To facilitate the various operations that have to be carried out on the message (like actually sending it), an envelope (the section called The envelope model) is placed around it containing generic information about the message contained within. 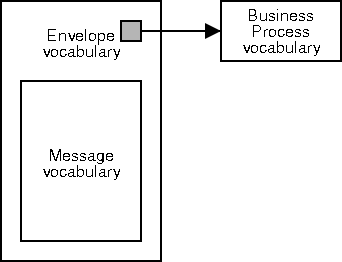 To aid in the processing, an external list of Business Processes (the section called Business Processes model) is maintained, containing information on what to do upon arrival of a message, information that tells the computer system how to process the message. The Business Process info is placed within the envelope.